Disclaimer: This topic has nothing to do with Arcade (soon to be renamed to “Arena”). In case the giant “Coming in Alpha 5” on the Inventory screen wasn’t a big clue I’m working on the Inventory and RPG parts of GRID for the next update. I just today got the Shop fully functional and wanted to solicit some opinions on the bit that comes next. 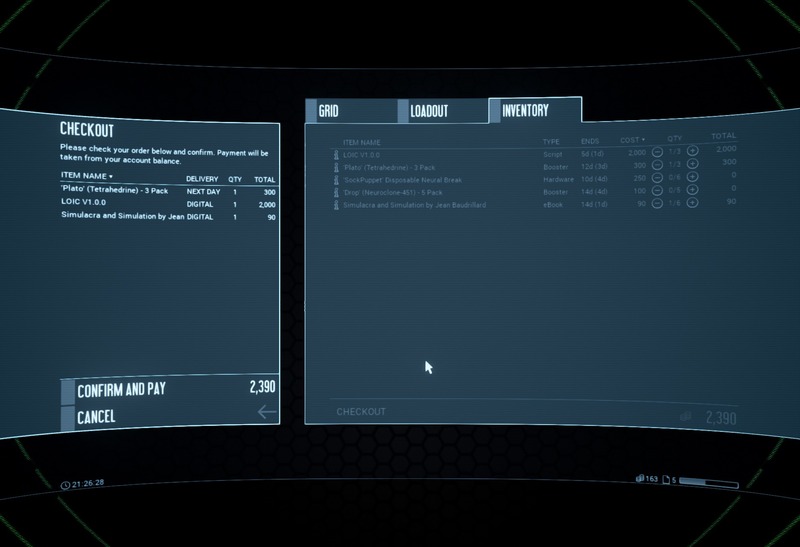 The Marketplace is where Items of all kinds are sold to aspiring Hackers. The primary Physical items are Hardware and Boosters and the Digital Items are Scripts and eBooks. Physical Items must be delivered before they can be used while Digital items are added to your Purchased Files instantly. Whenever you sell anything (be it physical or digital) you will instantly receive payment and the Item or File will be removed.